Chevrolet Aveo five-door made it public debut at the Paris Auto Show back in October 2010. 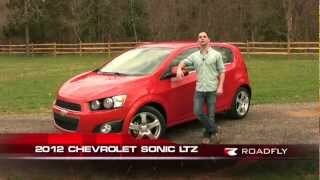 At Detroit Auto Show 2011, Chevrolet unveiled the all-new Chevrolet Sonic 2012 for the US market (called Aveo outside the USA). Its youthful, aggressive design combined with an agile ride and handling delivers an efficient, fun-to-drive small car. Both the Aveo four-door and the Aveo five-door will be launched on the European market starting in mid-summer 2011. DETROIT – After the world premiere of the Aveo five-door in Paris in September 2010, Chevrolet unveils the all-new 2012 Sonic for the U.S. market (called Aveo outside America) at the North American International Auto Show in Detroit. Its youthful, aggressive design combined with an agile ride and handling delivers an efficient, fun-to-drive small car. Both the Aveo four-door and the Aveo five-door will be launched on the European market starting in mid-summer 2011. 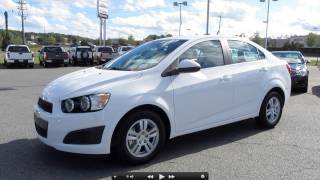 The Sonic/Aveo is offered in two body styles: a stylish four-door sedan and a sporty five-door. Each delivers class-leading rear-seat roominess and cargo space. "The all-new Chevrolet Sonic blends the practicality of a small car with the passion for driving that Chevrolet vehicles like the Corvette are known for," said Chris Perry, vice president of Chevrolet marketing. Production of the Sonic for the American market begins later in 2011 at the General Motors Orion Assembly Center in Michigan, which received a $545-million investment in upgrades and retooling, and will help restore approximately 1,000 jobs in the metropolitan Detroit area. Aggressive cues, including fender flares and motorcycle-inspired round headlamps, are blended with global design cues – a dual-element grille and round taillamps – for a design instantly recognizable as Chevrolet. The leading edge of the hood forms a character line above the headlamps, which flows in a sleek side profile characterized by uninterrupted body side lines, a high beltline and low roofline. The side mirrors carry the same shape as the car and seemingly disappear into the profile. The sedan and five-door models are distinctively different. The five-door carries a tight, two-box shape with aggressive, diving feature lines, while the sedan's "notchback" profile has a more upscale and mature presence. At first glance, the five-door model looks like a three-door hatch because the rear door handles are discreetly located in the "C"-pillar area. The rear of the five-door continues with unconventional details, including exposed, motorcycle-inspired rear taillamps. Details that reinforce Sonic's quality and attention to detail include chrome grille surrounds and matte black honeycomb grille inserts on all models, while a range of large wheel sizes, including 17-inch alloy wheels, reinforces its sporty demeanor. 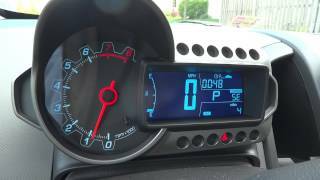 Sonic's cabin complements the motorcycle-inspired exterior with a detailed instrument cluster featuring a large, round analog tachometer set within an asymmetrical LCD readout, with a large digital speedometer display. The interior includes storage compartments in the center stack and doors. The rear seats fold flat for carrying larger items. Front bucket seats are standard and heated front seats are available. The Sonic brings agility and a fun-to-drive feel that is rare in the segment. 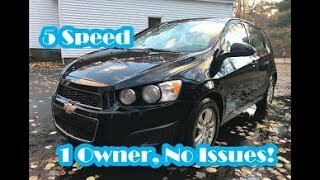 Engineers tuned the Sonic/Aveo's confident ride and handling, giving it a more direct and athletic feel, while balancing the vehicle for a broad range of driving. All models feature a MacPherson strut front suspension with coil springs and stabilizer bar, and a semi-independent, torsion beam axle-mount compound link-type rear suspension – featuring a robust, tubular V-shape beam – with gas-charged shocks. The front and rear tracks are identical at 59.4 inches (1,509 mm), for well-planted stability and excellent balance. 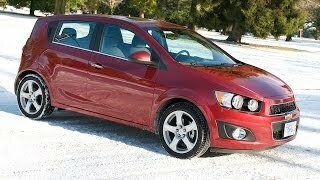 Sonic/Aveo's body structure is designed to be one of the stiffest in the segment. Its rigidity enabled engineers to tune the ride and handling more precisely. Sonic/Aveo's unique "flat top frame" cradle, for example, assures optimal stiffness in the front chassis portion of the vehicle. The rear axle is essentially a straight axle without contour for packaging restraints and reduced noise, vibration and harshness.